With spring right around the corner, the joy of trying to maintain my daughters’ sensitive skin along with mine from becoming dry is a job itself. There are so many over the counter products that contain animal testing, parabens (which has been said, ‘there is no direct effective link with cancer’), and petrolatum, I’m usually skeptical to try anything new because we both also suffer from seasonal eczema that most products are like water on our skin. The products I usually use are pure olive oil for the body. I use honey, egg whites, and oatmeal for my monthly facial. When I was asked to write a story on a product produced by a company called the Savannah Bee Company – before replying yes – I did a little research and thought I had to do it. The reason I agreed to do a story on this company’s products is because of the founder/owner Ted Dennard, who is a professional beekeeper, and head beekeeper of his company. 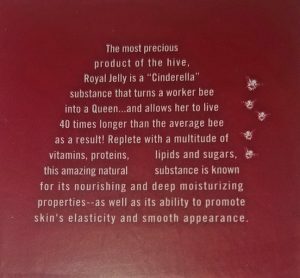 Secondly, I was in awe and excited to know that his products contained beeswax, honey, royal jelly, and propolis ingredients that come directly from a beehive. These are natural ingredients that as I was reading on the back of the box, I was able to understand what they meant, and did not have to Google where they came from. Which got me thinking: How many over the counter products you use are natural? How many over the counter products you use contain less than seven ingredients? Can you the buyer can pronounce or understand the ingredients? How many over the counter products are handled also by the owner/founder because he has a passion for bees and honey and wants to share it with the world? After using two of Savannah Bee Company’s products and no longer being forced to do homemade facials by my daughter, or apply olive oil to our skin it is easy to say we have a winner in our household. Although Savannah Bee has different types of products my favorites are the Royal Jelly Body Butter and Honey & Beeswax Body Balm. Both products smell incredible, and if I had to compare Royal Jelly Body Butter, I would say think of it as your over the counter cocoa butter but 10 times better truly made for a ‘Queen’ as it states, and the Honey &Beeswax Body Balm is excellent to have if you work in the medical field and wash your hands all day. Savannah Bee products may not be for everyone if you are allergic to bees, however my advice when purchasing a beauty and health product is to make sure when you are reading the ingredients that you are able to understand what you just read, make sure the products do not have more than 7 ingredients or contain some type of acid like product. Your skin is the window to your health, it is up to you to take care of it and show the world how you want to be seen.